Way Off Broadway has graciously sponsored this post by treating my husband and me to a show! As always, all opinions are my own. In our town of Frederick, Maryland we get to experience the BEST of all worlds! If you want to visit a farm and watch the cows get milked before you enjoy farm fresh ice cream, you can do that at South Mountain Creamery. If you would like to be one with nature, and take a hike while inhaling Mother Nature’s beauty, you can visit Cunningham Falls State Park. And, if you have the desire to experience some culture in your life, Frederick is chock full of things to do and see! One thing that Frederick prides itself in is our selection of live theatre! For some info on Frederick’s theatre scene, check out my post on Live Theatre in Frederick County. In my opinion, one of our most unique and interesting theatre venues is The Way Off Broadway Dinner Theatre and Children’s Theatre. When you think ‘dinner theatre’, you may think hoity toity and stuffy. Way Off Broadway is so different! As soon as you walk into the lobby area, you kind of get a sense of going back in time. I’m not even sure why I felt that, but it may be the fact that it’s family owned and run, and that it’s quite an intimate venue. But, don’t let the intimacy fool you into thinking that the shows are anything less than stellar. 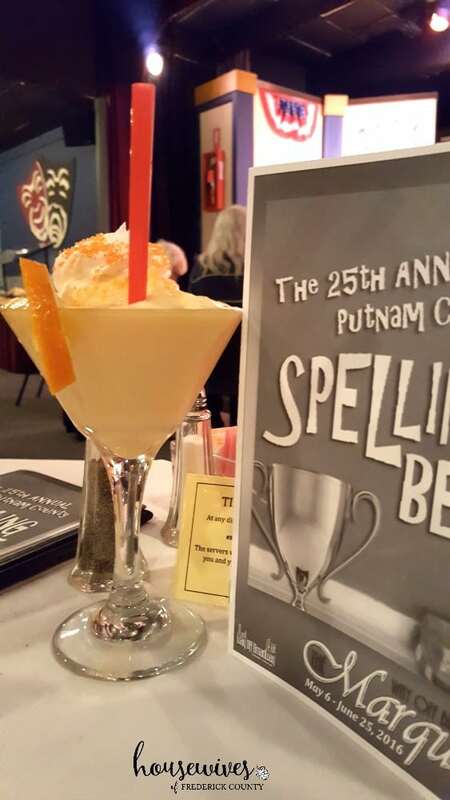 On a recent Friday night, my husband and I went to see Way Off Broadway’s current mainstage show, “The 25th Annual Putnam County Spelling Bee“. This show would probably be rated a PG13 if it were a movie, so keep that in mind before bringing kids. Not gonna lie, my husband is probably the opposite of a sophisticated theatre-goer. He’s a good ole Southern boy who is happiest sitting around a campfire and listening to country music. Well, he and I laughed the ENTIRE show! Each and every actor was amazing, and because Way Off Broadway is relatively small, you almost feel as if you are part of the show (for this particular show you can even sign up when you get there to be a part of the spelling bee up on stage!). Oh! 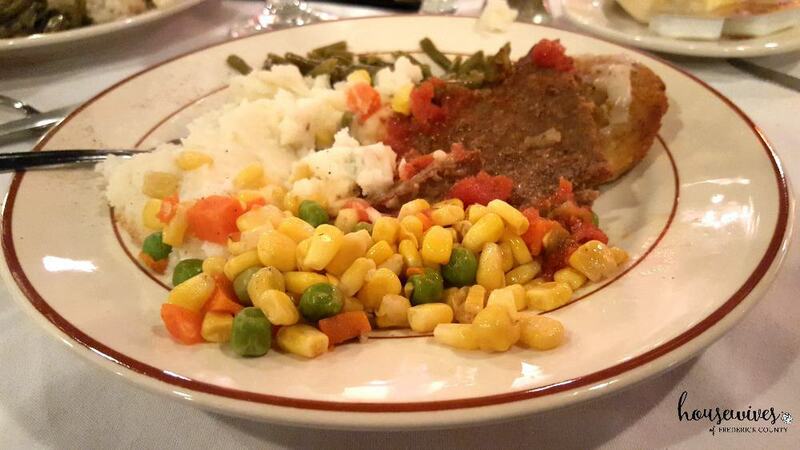 And did I mention the buffet dinner is dee-lish! It’s home cooked, comfort food – perfect for the end of the week/beginning of the weekend when you’re ready to relax and have fun. The staff will let your table know when it’s time for you to get up and get your food, and then again if you’re interested in seconds. You even get dessert! 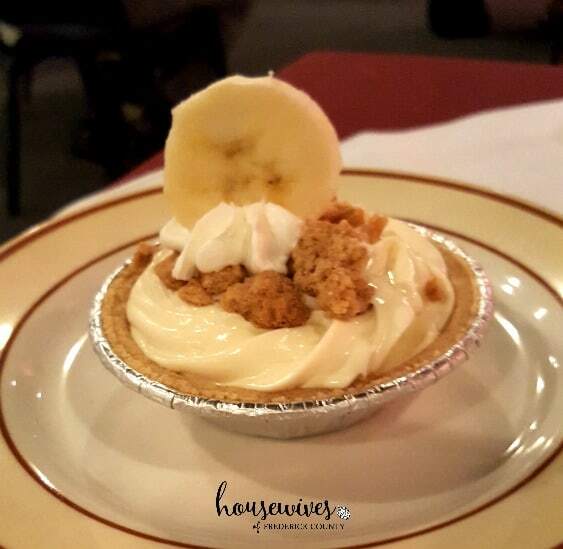 My hubby got a mini banana cream pie, and I opted for ice cream (they have toppings set up at the buffet!). The servers are also the actors in the show, so it’s so fun to be able to interact with them throughout the evening. For this particular show, they created a signature drink (I think they called it The Spelling Bee) which was like a creamsicle “for grown-ups”. Probably THE most refreshing, delicious cocktail I’ve ever had. SO, if you’re in the mood to do something different DEFINITELY go catch a show at Way Off Broadway! 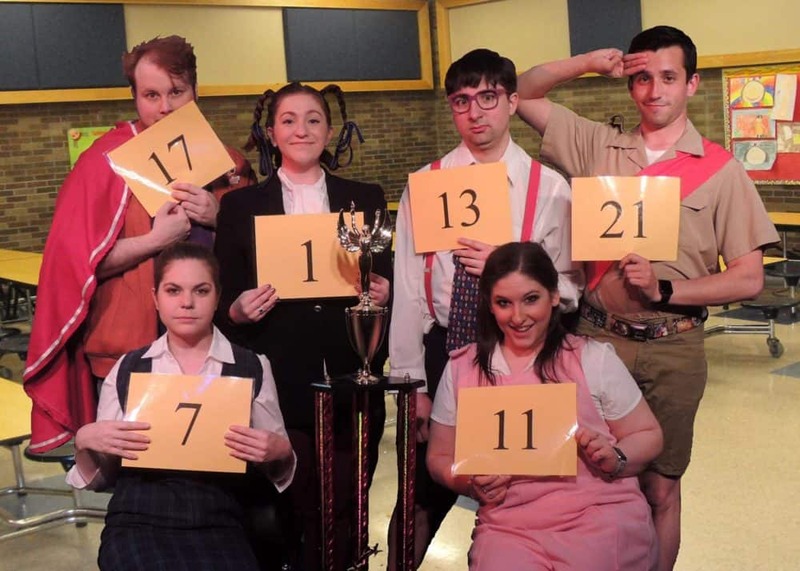 “Spelling Bee” runs through June 25th on Friday evenings, Saturday evenings, and Sunday matinees. Go to Way Off Broadway’s website for all of the details!! Have you seen a show at Way Off Broadway? If so, tell us about it in the comments! And, if not – check one out! And, tell ’em Housewives of Frederick County sent ya! Saw a show thete a long time ago and been meaning to go back. Need to put this on the summer to do list! Definitely! I always forget how fun it is to go see live theatre! WAY OFF BROADWAY WOULD LIKE TO OFFER YOU A DISCOUNT ON TICKETS THIS WEEKEND. PURCHASE TICKETS FOR FRI. 6/3, SAT. 6/4, OR SUN. 6/5 AND MENTION “HOUSEWIVES OF FREDERICK COUNTY” & GET $10.00 OFF PER TICKET. HOPE TO SEE YOU AT THE THEATRE. This is awesome Deb! I’ll post this on our Facebook page, Twitter and Instagram!